What Is a 403(b) Plan and How Do You Contribute? When it comes to retirement planning, everyone knows it's important to start early -- but what options do you really have? There are lots of retirement plans -- and each seem to operate on a different basis. But when determining which is right for you (or even what options you have), it's important to know the ins and outs of the plans that are available to you. And while its counterpart -- the 401(k) -- may be more well-known, a 403(b) is a great and tax-efficient way to save for retirement. But what is a 403(b) anyway? Who qualifies for one? And how do contribute to it? Put simply, a 403(b) plan is a retirement plan available to non-profit, public school, and 501(c)(3) employees (as well as some ministers) that is tax-advantaged. But, naturally, there's a little more to it. Just like other retirement funds, 403(b)s allow employees who qualify to contribute funds from their income and invest them in mutual funds or annuities to help them accumulate money for retirement. And, being tax-advantaged, 403(b) plans can help you accumulate even more money over the course of your working years. Just like a 401(k), 403(b) plans allow you to contribute funds pre-tax. The appeal of a 403(b) plan comes from how it is structured to save you big on taxes. Contributions to 403(b) plans are (in almost all cases) tax-free due to how they are taken from your income. In that sense, 403(b)'s boast a handful of tax benefits, including being exempt from income-tax on contributions to your 403(b), not having to pay taxes on your earnings until you withdraw them, and, if you qualify, the ability to claim a Retirement Savings Contributions Credit. Annuity contracts with insurance companies. A custodial account made of mutual funds -- called a 403(b)(7). Retirement income accounts for church employees, typically invested in mutual funds and annuities - called a 403(b)(9). Additionally, most 403(b) plans will offer low, medium, and high-risk options for investment. But, much like other retirement plans, 403(b) plans offer Roth options as well. With a Roth 403(b), much like Roth IRAs, contributions are after-tax, but distributions aren't taxed, and the contributions are able to grow typically tax-deferred. Still, much like a 401(k), you can typically (with some exceptions) only withdraw your funds from a Roth 403(b) after the age of 59.5.
Who is Eligible for a 403(b) Plan? While not an exhaustive list, those who qualify for a 403(b) plan include employees of the government, non-profits, 501(c)(3) tax-exempt organizations, public schools, and some churches. Sometimes, 403(b) plans are available for hospital employees. But basically, just think most non-profit organizations. Additionally, if you are vested in your 403(b) plan, you can typically bring it with you to your next job. 401(k) and 403(b) plans are actually pretty similar, but there are a few differences worth noting. First and foremost, 403(b) plans have different eligibility requirements -- so, unlike a 401(k) plan (which is intended for private sector, for-profit employees), you must be an employee of a public school, non-profit, 501(c)(3), or some churches. Additionally, since not all companies or organizations qualify to give out 403(b) plans, it's an either-or situation regarding which your employer will offer (a 401(k) or a 403(b) plan). Additionally, 403(b) plans were once restricted to only annuities, although this was changed in the 1970s to include mutual funds and other investments. Given the nature of the organizations that are able to offer 403(b) plans (mostly non-profit or government organizations), 403(b)s are not able to accept profit sharing from the employer that is sponsoring them. One of the other key differences between 401(k) plans and 403(b) plans is that the latter is not always required to comply with the Employee Retirement Income Security Act (ERISA) -- meaning they don't have to adhere to many of the regulations found therein. This is possible due to how 403(b) plans are not technically considered employer-sponsored by the Department of Labor (once again, as long as the employer does not contribute funds themselves). If an employer offering a 403(b) plan does not contribute to the fund (or match contributions, which some do), they are exempt from regulations like ERISA. However, if the employer does decide to contribute funds, the 403(b) may be subject to these regulations -- like annual non-discrimination testing. Moreover, 401(k) plans often offer much higher match programs (due to how many 403(b) plans avoid them in order to maintain their non-ERISA status). Still, both 401(k) and 403(b) plans have similar contribution caps, rollover rules, and other regulations, so in the taxonomy of retirement plans, they should be thought of as having a common genus. There are a bunch of benefits of having a 403(b). And before opting to contribute to one, you need to know what you're getting. For starters, most 403(b) plans allow you to contribute pretax funds into your retirement account, which can reduce your total amount of taxable income (yay). But contributions are also tax deductible, so if you are in a certain marginal tax bracket, having your contributions deducted from you income could mean big savings. Despite not qualifying for tax-deduction like a normal 403(b), Roth 403(b) plans don't tax withdrawals -- which translates to a huge "cha-ching" for you. Basically, in the long-haul, Roths are more tax efficient (save you money on taxes) than traditional 403(b) or 401(k) plans. However, while you can withdraw contributions from a Roth IRA at any point without penalty, you will be penalized (in most cases) for withdrawing contributions from a Roth 403(b) before you are 59.5 years old. This is a huge asset for 403(b) plan holders, because all the interest, capital gains, and dividends you accumulate are free to grow on a tax-deferred basis (meaning tax-free until you withdraw them). This can free you up to switch your portfolio up more frequently without having the added concern of its tax-efficiency. In fact, you can often invest in higher-risk investments and trade them more freely. In most cases (unless you have a Roth 403(b) plan), pretax contributions are only taxed when they are distributed, which means you'll probably end up saving money on taxes due to how many retirees have fewer living expenses and are often in a lower tax bracket at the time of retirement vs. when they were in the workforce. So, having the taxes come on the rear-end of the retirement fund can actually be really beneficial. 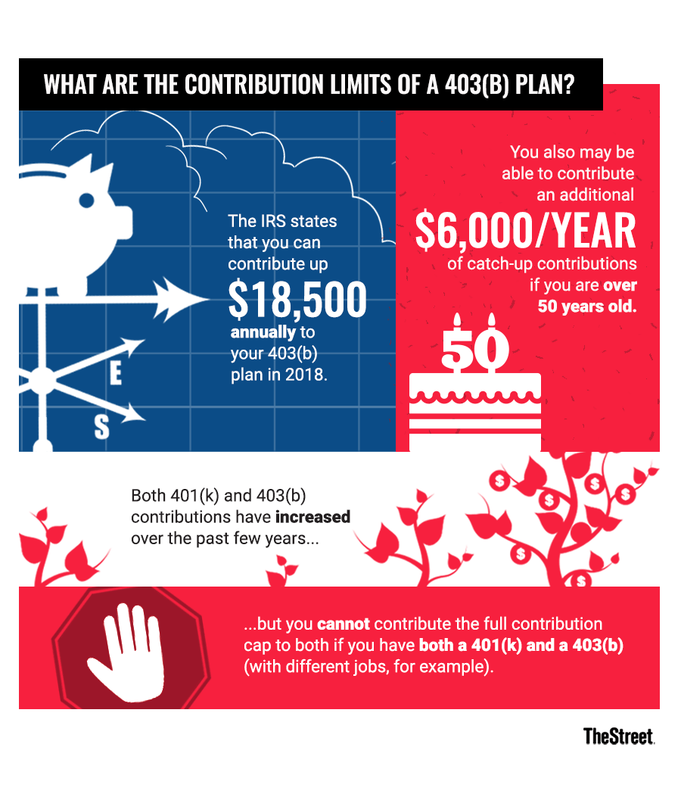 Another huge and unique aspect of 403(b) plans is that you may be eligible for additional contributions to your plan if you have been with the same organization for 15 years and haven't contributed past the cutoff point before (which was $5,000 in 2017). Employees who qualify for this exception need to refer to the IRS Publication 571 to determine how much additional contributions they may be allotted. While not all 403(b) plans are non-ERISA, the ones that are typically have lower expense-ratios due to how there are fewer regulations placed on them - because, if you remember those non-discriminatory tests required by ERISA funds, they require less reporting. According to the IRS, as of 2018, you can contribute up t o $18,500 annually, with the possibility of an additional $6,000 per year of catch-up contributions if you are over 50 to your 403(b) plan. This is massive compared to the $5,500 you can contribute to an IRA or Roth IRA in 2018 ($6,500 if you are over 50). Particular to 403(b) plans, you can sometimes invest in "institutional funds" that otherwise have very high investment minimums, but who waive this for holders of 403(b) plans. Vanguard (VOO - Get Report) Institutional Index Fund Institutional Plus Shares (VIIIX) has a plan like this, which allows 403(b) holders to invest without enforcing the usual $200 minimum, according to Investopedia. Additionally, although it varies largely depending on the particular 403(b) plan you have, many employers allow you to actually take out loans on your 403(b) -- however, there are very strict penalties if you default on the loan or miss a payment, enforced by the IRS. Still, there are some downsides to 403(b) plans you should take note of. As mentioned earlier, a possible downside to 403(b) plans is that you cannot withdraw contributions from your plan without penalty until you are at least 59.5 years old -- otherwise you'll face a penalty. Additionally, when you do withdraw your funds post-59 years old, you will be taxed on that withdrawal based on whatever tax bracket you fall into at the time. This could be bad news for people who make more money later on in their life or career, which is why some people opt for Roth IRAs (which are taxed at the onset and aren't dependent on your tax bracket for withdrawal). Additionally, withdrawals from your 403(b) are taxed as income, not as capital gains - so, you're foregoing the benefit of having your funds being treated like long-term capital gains. Before the 1970s, you could only invest in annuities through a 403(b) plan. And despite branching out to include mutual funds and variable annuities, 403(b) plan investment options are still pretty limited - so, for the active investor who might like to invest in individual stocks, bonds, or even other things like real estate, a 403(b) may not be for you. It's fairly simple to contribute to a 403(b), but you need to make sure you thoroughly understand your company or organization's requirements, specifications, and options regarding 403(b) plans. There are three kinds of accounts for 403(b) plans: annuity contracts with insurance companies, custodial accounts made of mutual funds - called a 403(b)(7), and retirement income accounts for church employees, typically invested in mutual funds and annuities - called a 403(b)(9). While not everyone will qualify for every type of account, be sure to check what your options are with your employer. Next, you'll want to decide what you can invest in. 403(b) plans have several different options for investment -- primarily mutual funds, fixed annuities, and variable annuities. Fixed annuities dole out set interest rates that are resilient to market fluctuations -- and, for between 1 and 5 years, will pay a higher interest rate. Additionally, equity-indexed annuities follow an index on the market like the S&P 500 (S - Get Report) or the Nasdaq. Still, a variable annuity plan doles out payments periodically, which are typically invested in mutual funds (so performance can fluctuate, and thus, your payments). In a custodial account, you are mostly investing in mutual funds via the employer-sponsored account. But, mutual funds have annual investment fees. Still, if you choose a custodial account, you are often able to choose your investment vendor (like Fidelity) but may not be able to have as many choices as you might with another retirement plan like an IRA. Still, some plans may offer a mixture of mutual funds and annuities. Whichever you choose, make sure you understand your options and the possible long-term benefits or downsides. Once you've decided on a plan, alert your employer to begin withdrawing an agreed-upon amount of your income from your paycheck to put into the 403(b) plan -- which, for example, could be 5%. In many cases, employers will match your contributions, up to $36,500 in addition to your contributions (which hit a cap, called maximum amount contributable (MAC) per year) -- so the most you can contribute combined to your 403(b) will hit $55,000 in 2018. However, if you don't make that much, your cap will be whatever 100% of your salary is. Employers will typically (if they do at all) match your contributions in percentages like 50% or 100%. Becoming vested may be largely up to your employer, who may have a different system of getting you vested in your 403(b) plan (for reference, being vested means how much of the contributions are fully yours vs. your employers). For example, some employers might get you vested a certain percentage per year - called graded vesting -- which gets you vested at, say, 25% per year - so after 4 years, you would be 100% vested. The benefit of being fully vested in your 403(b) plan is that you can take your money with you if you leave your job, whereas if you aren't fully vested, you might not be able to take the whole sum. For those 50 years old and over, you can often make catch-up contributions to your plan if you haven't contributed or have contributed a small amount in previous years. What are the Contribution Limits of a 403(b) Plan? As mentioned earlier, the IRS states that you can contribute up to $18,500 annually to your 403(b) plan, with a potential of contributing an additional $6,000 per year of catch-up contributions if you are over 50 years old. Similarly, 401(k) plans have the same contribution limits, with an elective salary deferral limit of $18,500 in 2018. Both 401(k) and 403(b) contributions have increased over the past few years, but it is important to note that you cannot contribute the full contribution cap to both if you have both a 401(k) and a 403(b) (with different jobs, for example). In this case, you need to track your contributions to ensure you don't surpass contribution limits for both your plans. Before you withdraw from your 403(b) plan, you need to know the right time to withdraw -- and, at the very least, the penalties for withdrawing early or in special circumstances. The best time to withdraw from your 403(b) plan is after you turn 59.5 years old, since that is how long it takes to withdraw your funds without a penalty. Of course, if you have a regular 403(b) plan, you will be taxed upon withdrawal of your distributions (since your contributions were made pre-tax), so it is good to know what tax bracket you fall into when you decide to withdraw your funds. You'll be taxed at income tax rates for your withdrawals. However, if you have a Roth 403(b), you may not be penalized for withdrawing early since contributions are made after-tax. And, you won't be taxed when you withdraw. Still, early withdrawals may be permissible under certain circumstances, like if you retire before 55 and comply with IRS regulations when making withdrawals, or medical expenses surpass 7.5% of your gross income, among other exceptions. On the April 1 of the year that you turn 70.5 years old, you will need to start making required minimum distributions (RMDs) -- the amount of which is determined by your life expectancy according to IRS's Uniform Lifetime Tables, as well as the total account balance your 403(b) has. Once you've weighed your options with withdrawal and decide to move forward, contact your plan administrator to obtain the appropriate paperwork. While the particulars of the forms will vary depending on your plan or circumstances, you will typically have to delineate how you'd like to be paid your distributions (like by check or direct deposit), as well as submit some documentation including your Social Security number. If applicable, you will receive a form 1099-R, which you must complete by reporting the taxable portion of your withdrawal -- and, in normal distributions, you will most likely use section 2a to delineate a pension or annuity distribution. You might also use form 1040 or 1040A if you can be considered a qualified distribution, or, if you can be considered to take a hardship distribution, use form 1040. Once you've completed the necessary forms, you will begin receiving distributions from your 403(b). However, be aware that you cannot pool multiple retirement accounts to meet distribution requirements. You can choose different ways to have your funds distributed -- for example, you can have distributions doled out as a scheduled payment (either monthly, quarterly, semiannually, or annually, typically with a $100 minimum), a partial withdrawal up to thrice a year, a total withdrawal, or a declining balance withdrawal that pays you bit by bit over time (but you need to be under 70.5 years to qualify). As with any investment or retirement plan, it is important to be aware of your current financial situation and be realistic about your financial goals. And, since 403(b) plans offer low, medium, and high-risk investment options, it is especially important to be aware of how much time you have left in the workforce before your desired retirement age. Typically, it is better to invest in high-risk investments when you still have several years for your portfolio to recover in case the market doesn't go your way. Similarly, it might be more advisable to go for a medium or low-risk investment portfolio when you are nearing your desired retirement age so as to ensure you have the most bang for your buck when you need it.